These easy tips will help you get crisp and clean paint lines when using a stencil with your Silhouette or Cricut cutting machine! I have a slight obsession with stencils and wooden signs. Ever since I started using Oramask 813 for my signs I’ve become obsessed with how easy they are to make. Plus, Oramask is super simple to weed which means I can pump out these signs out quickly and easily! And you know how much I love quick and easy projects. Of course, then Chris comes along with a beast of a design to weed and all my hopes of “quick and easy” went right out the window. 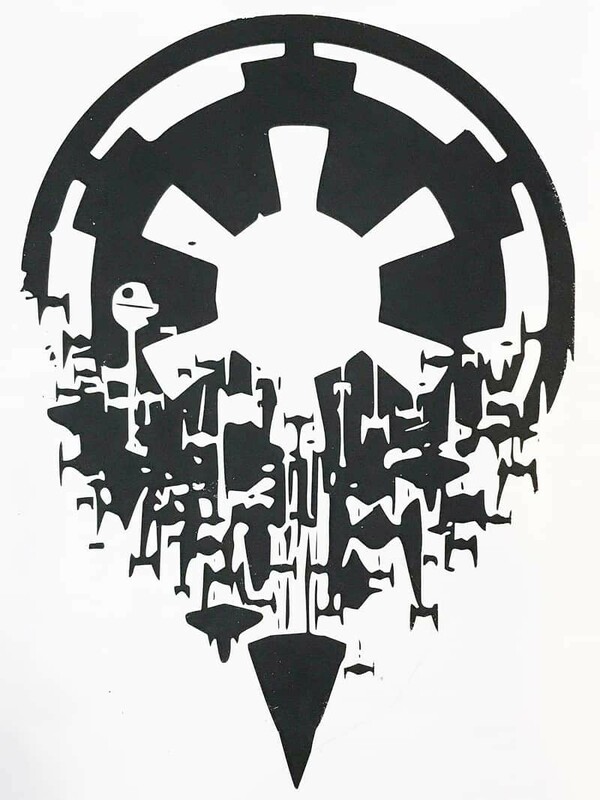 Chris asked me for the Empire sign a while ago and I kept putting it off because I did not want to weed that complicated design. I was also a little afraid that if I painted it the paint would bleed underneath the stencil and it would be ruined. So I kind of had to talk myself into even doing the project in the first place. And then worry about how to stop the paint from bleeding through a stencil. I’ve always had an issue where the paint would bleed through the stencil and leave globs of unwanted paint in spots all over my wood signs (this sign is one of the worst offenders if you see it in person!). I have gotten better at stopping crazy amounts of bleeding underneath my stencils but it was still a problem. And since I’m a major perfectionist I wanted to stop the bleeding altogether (if possible). When I made the signs for Chris’s office I decided to try two different methods to see which one kept the paint from bleeding through a stencil better. Both worked but I definitely liked one better than the other. And while it will add some time to your projects it is well worth it to make sure that your signs come out exactly how you want them too. Clean, crisp lines with minimal clean up required. I’d heard that painting a layer of paint (whatever your background color is) on top of your stencil helps keeping the bleeding to a minimum. I had never tried it but I figured I’d give it a shot, then I took it one step further. For a second sign I used a combination of sealer and paint on top of the stencil to see how that would hold up. Both methods work and I would recommend you trying both to see which one works best for you. Personally, I really liked the paint on top of the stencil. And as long as you do that in addition to dabbing a thin layer of top paint you will have minimal clean up once all is said and done. Using sealer isn’t a bad idea and it does work. But why do an extra step IF you don’t have to? These tips to stop paint from bleeding through a stencil…. give your projects the crisp and clean lines you’ve been craving. Let’s find out how easy it is to stop paint from bleeding through a stencil! 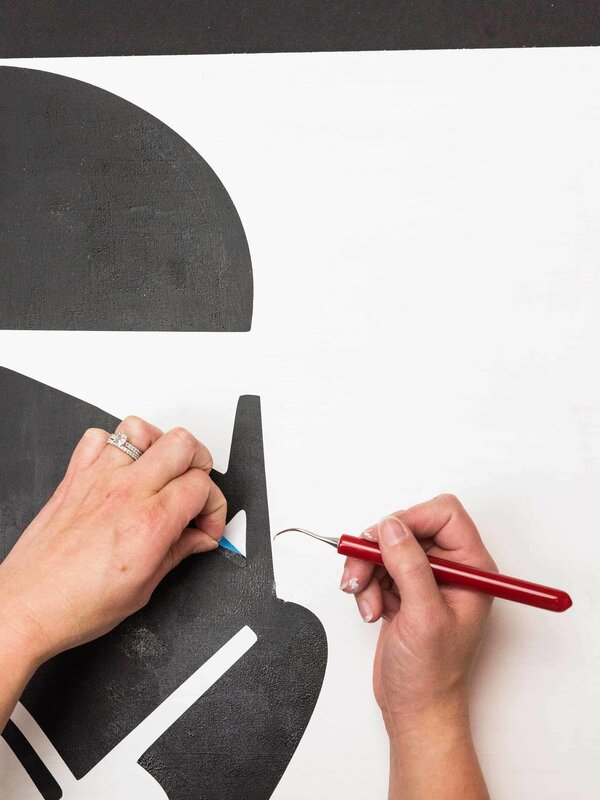 Get crisp and clean lines when painting designs on wooden signs with these tips to stop paint from bleeding through a stencil! Cut out your design and weed it. Set it aside. Paint your wood sign and set it aside to dry. 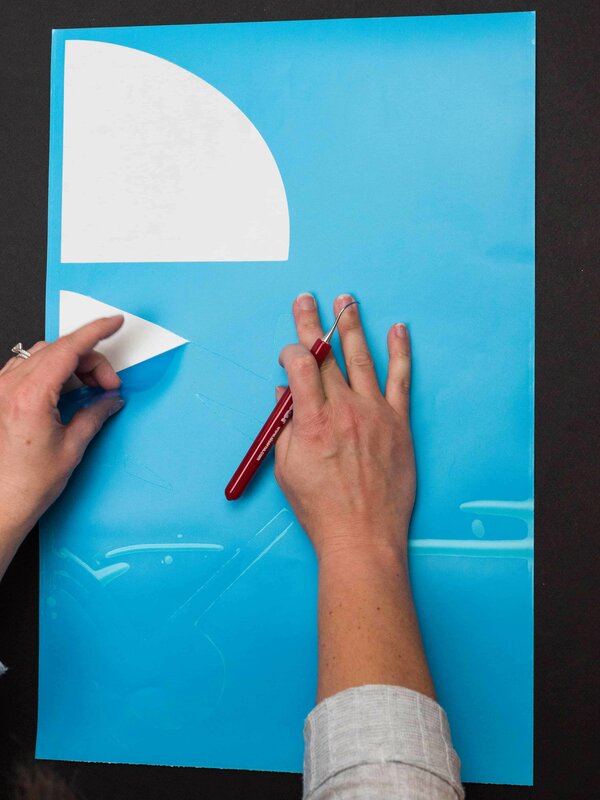 Lay the transfer tape over your vinyl design and scrape it with your application tool. Pull up the transfer tape slowly, making sure that the entire design comes up with the tape. If it doesn't, put the transfer tape back down and scrape it with the application tool and continue pulling the tape up. Lay the design down on your painted piece of wood and peel up the transfer tape. Then use your application tool to scrape (or rub) the stencil onto your wood. Spray the entire piece of wood with your Sealer. Let it dry for 10 minutes. I found that my vinyl bubbled a bit after being sprayed with the Sealer so I used my application tool to rub it back down. Worked like a charm! Then paint a very light layer of paint (the same that you used for the background layer on your wood) over the stencil and let it dry. Make sure there are no bubbles (if there are, use your application tool to rub them out again). Paint a very VERY light layer of paint (mine is the black paint) on top of the stencil using a round stencil brush. Remember to DAB the paint...that also helps to stop the paint from bleeding. Let the paint dry to the point of being tacky and then pull up the stencil. Now is the time to clean up any bleeds, if you have any! These tips aren’t fool proof and I’m sure that I’ll still have paint that bleeds through from time to time. But, with practice each sign will get better and better. Need some signs to try these tips out on? These are my favorites!